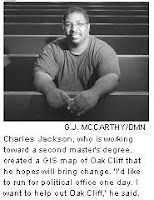 This recent article spotlights student Charles Jackson's use of GIS in an undergraduate project on the Oak Cliff neighborhood in Dallas, Texas. Charles is a student I assisted with on may GIS projects. For this one in particular, he used GIS to create a Google Map webpage of various resources available in this low-income area. Charles' online project is entitled Oak Cliff Interactive. Background information about this project and the technology used can be found in a blog entry I wrote last year. I saw you worked down in Laredo and was looking for some GIS jobs/contacts down there. I graduted from A&M International and now have a degree in GIS also and was looking for something down there. It seems that GIS knowledge is limited down there with potential growth. What do you think? Yep it's been a while since I've been down to Laredo (5 to 6 years now), but while I was there the GIS knowledge and experience of folks at the university and in local government definitely had room for potential growth. At the university (A&M International), the folks over at the Texas Center for Border Economic and Enterprise Development were and continue to work extensively with large datasets and when I was there they were really getting into GIS.